Summary: This is a sequel to Who’s the Doctor? and Where’s the Doctor?, my previous BtVS/Doctor Who crossovers. 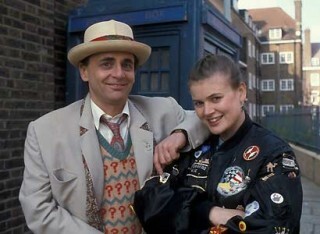 This one involves the Seventh Doctor and his companion Ace. Chapter One is here. And that’s all! Thanks to ladyofthelog and snickfic for keeping this comm going! Word count: Probably about 4000 when complete. Word count: About 4000 when complete. 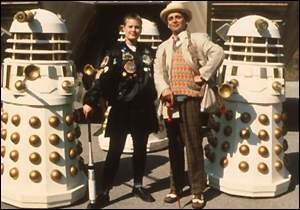 This one involves the Seventh Doctor and his companion Ace. Disclaimer: All series characters and good stuff belong to Joss Whedon, Mutant Enemy, etc. I am responsible for the lame dialogue and most of the plot. Summary: This story was supposed to be a subplot of the story I posted earlier this round, “The Trouble with Harriet,” but the subplot kept moving away from the main plot, so I’m presenting it as a standalone. This is set in my cheerful, AU version of Season 6 where everyone sort of gets along and Spike and Buffy are a couple. Dawn gets a job. And she’s making surprisingly good money. How could that possibly lead to problems? Thanks: to revdorothyl for the beta and to enigmaticblues for maintaining the comm. Disclaimer: All series characters and good stuff belong to Joss Whedon, Mutant Enemy, etc. I am responsible for some original characters (although I stole names from Hitchcock) as well as the lame dialogue and most of the plot. The idea, of course, is stolen from the classic movie, The Trouble with Harry. Summary: Buffy really needs a vacation, so when the chance arrives, she takes it, even though with a wandering corpse on the loose it’s almost, but not quite, a busman’s holiday. This is set in my cheerful, AU version of Season 6 where everyone sort of gets along and Spike and Buffy are a couple. Thanks: to keswindhover and revdorothyl for the beta and to enigmaticblues for maintaining the comm. Because I have the world’s most wonderful betas, this will all be posted by midnight, US central time. I’ve removed the WIP warning. If people will stop holding meetings and dropping bombshells at work, I’ll have this done today. If not, I’ll post the ending on the free day, July 1. The next chapter will be up on my afternoon break. Thanks: to keswindhover for the beta and to enigmaticblues for maintaining the comm. I posted the first chapters during an earlier round, and I’ve finally almost finished this story. It was going along swimmingly until work and the Doctor Who finale ate my brain. But if I can’t finish the last two chapters and epilogue by today, I’ll post them on the free day, July 1. In the meantime, I have several chapters ready now and will post them throughout the day. The Trouble with Harriet, 2/? The Trouble with Harriet 1/? I’m ashamed to admit I won’t get this story finished by the end of today. This bugs me to the point that I’m having classic anxiety dreams about not finishing homework and term papers and failing classes, but I’ve realized the story had more potential than I originally thought and I don’t want to post when I know I can do better than the crap that comprises the middle section of the fic right now. I’ll have two chapters done by the end of today and will post the rest on my LJ as I finish it. Thanks: to keswindhover and revdorothyl for beta and to enigmaticblues for maintaining the comm.